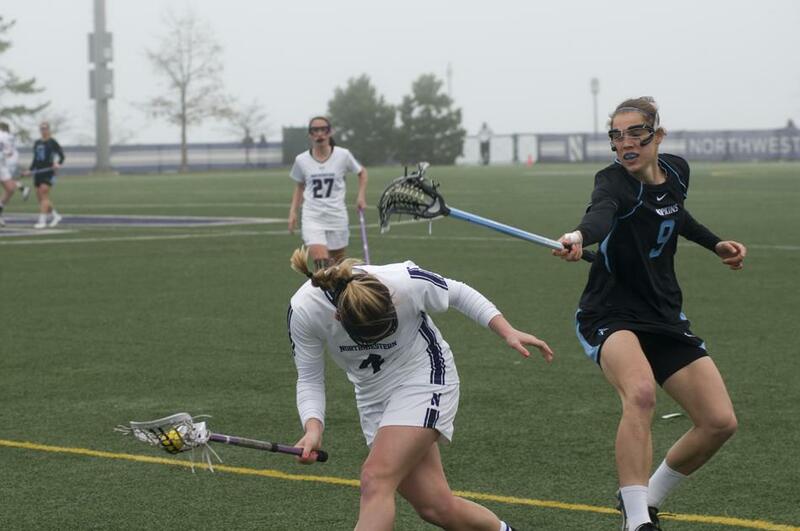 Senior Kat DeRonda gets knocked on the head by a Johns Hopkins player Sunday. DeRonda continued her recent tearing, netting four goals, but Northwestern lost 12-11 in double-overtime. Northwestern’s game Sunday at Lakeside Field lived up to its high-profile billing. As a chilly fog rolled off Lake Michigan, the No. 5 Wildcats (9-4, 3-2 ALC) fell to the No. 13 Johns Hopkins Blue Jays (11-2, 2-2) 12-11 in double overtime. The battle of American Lacrosse Conference foes was incredibly tight throughout, with four lead changes and six ties. The first seven minutes belonged to NU, with the Cats taking advantage of Blue Jays freshman goalkeeper Caroline Federico, who was making her first career start. NU got three early scores from midfielders senior Christy Turner, senior Kat DeRonda and junior Jess Carroll. Johns Hopkins battled back over the next ten minutes, scoring four goals around another Cats tally to even the score at 4-4. NU looked poised to enter halftime with a lead when it received goals from DeRonda and senior midfielder Kate Macdonald in the final five minutes of the first period, but Johns Hopkins scored twice with under a minute remaining to even the score once again. The Blue Jays kept pushing until the final second ticked off only to have junior goalkeeper Bridget Bianco make a pair of athletic saves to preserve the tie. The Cats looked revitalized with two quick goals in the second half from DeRonda and senior attacker Alyssa Leonard. Like clockwork, though, the Blue Jays stormed back to score the next three tallies and take their first lead. NU caught a break with 10 minutes remaining when an errant Johns Hopkins pass rolled into the neutral zone. DeRonda scooped it up, charged 40 yards down the field and buried it into the back of the net to even the score for the Cats. Sophomore midfielder Kaleigh Craig scored minutes later to give the lead back to NU, and the team looked ready to run out the clock and take home a hard-earned victory. But the Blue Jays weren’t about to roll over. They forced a turnover with two minutes to play and found the net, sending the game into overtime. The fog intensified and rain began to fall at the opening draw of the extra periods. Despite the added weather difficulties, Johns Hopkins struck first to reclaim the lead. The squads switched sides for the second overtime period, and the Cats quickly scored to equalize the game again. Still tied at the conclusion of two overtime halves, the game proceeded into sudden death. After an additional five minutes of play, the Blue Jays snuck a goal past Bianco to take home the win. Despite the tight nature of the game, Amonte Hiller seemed unimpressed with her team’s performance. NU will conclude its ALC schedule April 19 against No. 4 Florida before wrapping up its regular season April 26 versus USC at Wrigley Field.